This was my final week before beginning to taper for the Rut. I covered 67 miles and logged 25200′ of climbing, much of which was high quality training (either high intensity, in difficult terrain, and/or in 90 degree heat. Or I was hiking in a fairly relaxed way). Really felt like I got something out of this set of runs, and I’m feeling very prepared (and stoked!) for the race. About that race… I digitized the course for the Rut in Google Earth, essentially by tracing the existing Google Maps route that exists on its website, and extracted the elevation profile. The distance is pretty close to the reported 50k. The vertical reported by Google Earth, however, is just shy of 12000′. Note that this is almost 4000′ more than is reported. I think that Google Earth elevation profiles often inflate vertical gain due to high-frequency trail undulations and errors in the GE DEM. To counter this, I just measured from obvious low points to obvious high points and summed all of the climbs that had a vertical above 500′ or so. I got more or less the same result. I can’t say that I really mind. I like vertical, and my training has tended towards more vertical and lower miles, because that’s the kind of terrain that I find compelling. I just hope that nobody gets sandbagged by an extra 50% of climbing (and descending) on top of an already significant figure. I’m also looking forward to a trip down the Main Salmon this coming weekend, with Molly, Louie, many friends, and (significantly) my brother, who’s flying in from the East for his first river trip through the Idaho wilderness. 26:45 up, then tagged the summit if University Mountain at 54:low. Done at 4PM. 27 up, but then a much faster trip over to University, hitting the summit at 51:03 before running over to the South Side trails and running the fun singletrack of the Sam Braxton trail. Started at 4:30. Short evening run with Louie. Finally cool enough for him to hang outside the early morning hours. Finally managed to visit the rugged Williams Range, in the heart of the (proposed) Great Burn Wilderness. Access for me was 12 miles off the northwest side of Lolo Pass. I’ve been wanting to visit this region for a while, having seen its craggy peaks from both the south and north, as well as fished Cayuse Creek, Kelly Creek, Crooked Fork, and the Lochsa, which all have their origins in this knot of not especially high, but remarkably pristine and beautiful peaks in a corner of Idaho that sees very little traffic. 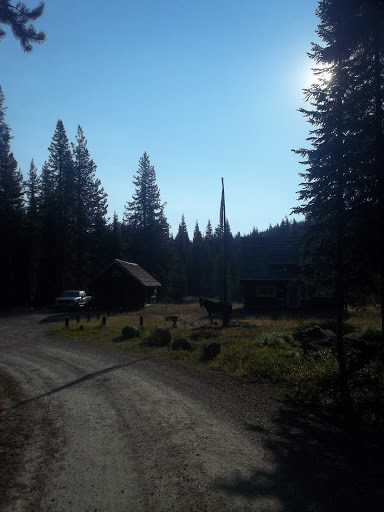 I left the truck at 7:30, running through an open old Lodgepole grove that shared a glacial valley with the upper Crooked Fork. 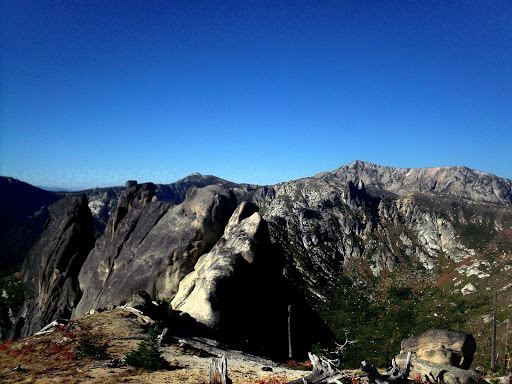 After a few miles, the trail started climbing steeply up the east wall of the valley, and I quickly reached a saddle below Granite Peak (7551′), my first objective for the day. This saddle was also the end of regular trail maintenance. 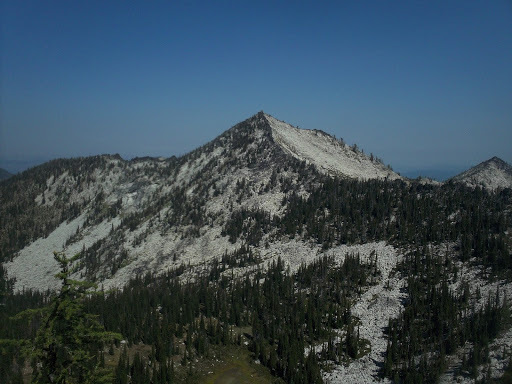 Granite Peak is about 2500′ and 4 miles from the trailhead, and I reached its summit about an hour. Climbing the solid rock pinnacles that give the peak its name was great fun and afforded excellent views of the route for the day, which would include both Shale Mountain (7612′) to the north, and Rhodes Peak (7930′, highest of the range) to the west. 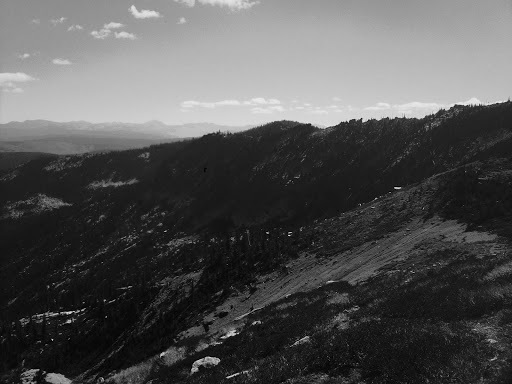 I followed the ridge from Granite to an unnamed high point, with intermittent aid from a very old and very underutilized horse track, and from there headed north to Shale, losing and regaining a lot of elevation in the process. The ridgelines were mostly bare, due to the fire that sterilized the soil in 1910, and from which the vegetation has not yet recovered. The lack of vegetation also allowed a great deal of erosion to occur, and the ridges were sometimes composed of almost beach-like sand, and sometimes of bunchgrasses. 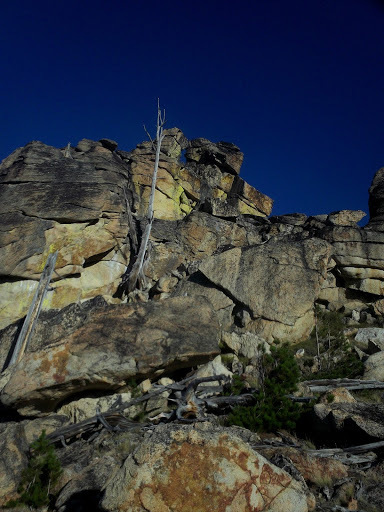 Hoodoos of resistant granite protruded haphazardly, but didn’t present the same kind of obstacles that ridgetop outcrops do in the Bitterroot Mountains. I was back to the highpoint connecting Shale and Rhodes just before the 4 hour mark, and made a conscious effort to push hard to Rhodes, finding a decent section of trail for a little ways. The trail once again petered out though, and I ended up taking a fairly inefficient to the south ridge of Rhodes, and from there the summit. Below Rhodes, I found the only (only!) water of the day (except at the very beginning), a little spring of tepid water in the hanging valley east of Rhodes Peak. It was low quality water, but a joy nonetheless, having been dry for almost two hours. 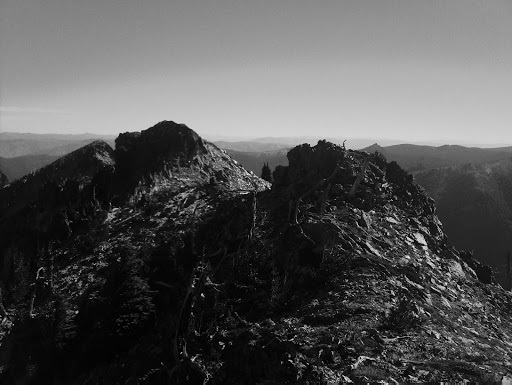 Now that I knew the routes, I ran the 10 or so miles back to Granite Peak relatively quickly, and from there, the descent down the open pine forests and good trail was a gas. 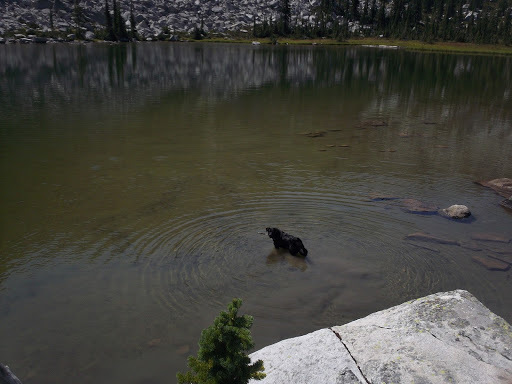 I reached the truck in good spirits (from eating enough sugar during the day) and time to spare to reach Lolo Pass, where I was to meet Molly to go camping. We ended up visiting the Elk Summit area, taking a good hike that evening out to an overlook from which views of the West Fork of Moose Creek and its mountains were visible. Great hike from the Kooskooskia Meadows trailhead, near Elk Summit. Pretty lakes (but no fish), and awesome views of the Roots and Graves Peak. Rhodes Peak summit view, with Ranger Peak in the distance. Ain’t nothing says America like a Mule hitched to a flagpole. A pleasingly symmetric Graves Peak. Making waves in Swamp Lake.